After so many years of buying and using different lawn mowers, I no longer get surprised or impressed whenever a new cheap petrol lawn mower is launched in the market. Especially a hand propelled one. I tend to feel the general build quality and feel is poor in many of the latest mowers. However, when I used the Hyundai HYM40P Lawn Mower the other day, I was totally surprised. The first thing to impress me was its classy and modern look. This mower proved to be the ideal machine for a medium sized garden. The other impressive feature of this machine was the 40 cm cutting width. This takes it to the smaller end of the petrol lawnmower market and at the same time the smallest in Hyundai’s range. Therefore, if you are looking for the ideal introduction to upgrade your electric mower to something with more bite this is what to go for. It has a 2.7 hp (2Kw) engine which definitely packs a punch but given the fact that it is 4 stroke you do not need to be worried about the noise as it delivers very little noise. It also has a three-stage cutting height adjuster. In this sense, the operator is able to easily control the finish of the lawn and at the same time, prevent the mower from being clogged with grass if you cut too much grass in one go. I also discovered that the Hyundai HYM40P cheap petrol lawnmower has a rotary cutting action which makes it an effective petrol lawnmower on all except the longest grass with a cutting width of up to 400mm and a cutting height of 25mm to 75mm. I also loved the fact that it had a compact dimension and low weight which promoted an easy handling and perfect manoeuvrability reducing the possibility of one getting tired fast. This also makes the mower suitable for extended use by any kind of users. You get to love Hyundai lawn mowers due to the soft grip handle. This is no exception. It has this kind of handle which makes it easy to handle and offers a better grip. 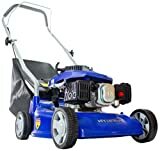 This particular lawn mower is a cheap petrol option and also has a 40 litre polyester grass collection bag which makes it easy for it to cope with only having one or two empties per mowing session. For easy storage, the handle folds over the main unit to become more compact. From experience, I can comfortably confess that this is one of the best small petrol mowers. It is the best one if you are planning to upgrade from your local electric mower. Even though a battery mower can offer the next best alternative, there is the issue of ensuring that the battery is always charged and ready. This is besides the cost difference between a petrol mower of this size and an equivalent battery mower. If you are in the market for a more powerful petrol mower check out the Frisky Fox Plus lawnmower.